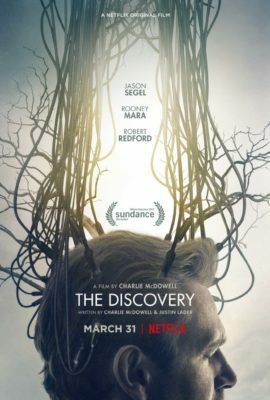 The Discovery is a peculiar and fascinating film full of existentialism and Jason Segel and is all the better for it. Premiering at this year’s Sundance film festival and distributed by Netflix this past week, Charlie McDowell’s film follows a near-future in which the afterlife has been scientifically proven, resulting in the mass suicide of millions of people hoping to discover what is in the beyond. While that longline may come across as insensitive to the very real problem of suicide in today’s culture, it is thankfully handled in such a way that allows for greater discussion through its internal rhetoric. Jason Segel plays William, a man on his way home two years after the initial discovery has taken place. On the ferry, he meets a woman, a bleach blonde Rooney Mara that is spectacular as always, with whom he seems to instantly feel a deep connection. The secrets that are unearthed throughout remain intriguing long after the credits roll, as such it would be a disservice to ruin anything further than what the initial promotional materials have revealed. Robert Redford provides a multi-layered performance as the man who has discovered the afterlife, yet is still haunted by years of lingering regret and grief. The film’s heady atmosphere and lack of overt spectacle may detract several less patient viewers as the film does feel slow in some moments, but the end result is a story that functions at its peak as an intimate slow-burn sci-fi. All of these elements are exemplified by some fantastic editing and an enigmatic electronic score by Danny Bensi and Saunder Jurriaans that dabbles with synth and the musicality of everyday household objects. Stroll Brandth Grøvlen’s cinematography also adds a layer of ingenuity, culminating in the film’s best scene: the two main characters first opening up to each other in a barely lit bedroom, just allowing the smallest amount of light to convey the frustrated emotions they are feeling. While the film dives head first into questioning its own reality and the meaning of life, when there is an afterlife it never dips its toes too heavily into the melodramatic. What exactly the discovery is leads to an extremely satisfying reversion that adds a complexity to the film rather than detracting from everything that has already happened. With his previous film, The One I Love, and this under his belt, McDowell is crafting a peculiar corner of humanist science fiction that is both enticing for his future products and welcoming in the sea of modern, overstuffed, 3D explosion-fests.